For the grunge rock band, see Ileum (band). For other uses, see Ilium (disambiguation). The ileum /ˈɪliəm/ is the final section of the small intestine in most higher vertebrates, including mammals, reptiles, and birds. In fish, the divisions of the small intestine are not as clear and the terms posterior intestine or distal intestine may be used instead of ileum. The cecal fossa. The ileum and cecum are drawn backward and upward. The ileum follows the duodenum and jejunum and is separated from the cecum by the ileocecal valve (ICV). In humans, the ileum is about 2–4 m long, and the pH is usually between 7 and 8 (neutral or slightly basic). Ileum is derived from the Greek word eilein, meaning "to twist up tightly". The ileum is the third and final part of the small intestine. It follows the jejunum and ends at the ileocecal junction, where the terminal ileum communicates with the cecum of the large intestine through the ileocecal valve. The ileum, along with the jejunum, is suspended inside the mesentery, a peritoneal formation that carries the blood vessels supplying them (the superior mesenteric artery and vein), lymphatic vessels and nerve fibers. 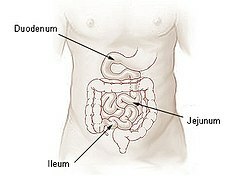 The ileum has more fat inside the mesentery than the jejunum. The diameter of its lumen is smaller and has thinner walls than the jejunum. Its circular folds are smaller and absent in the terminal part of the ileum. While the length of the intestinal tract contains lymphoid tissue, only the ileum has abundant Peyer's patches, unencapsulated lymphoid nodules that contain large numbers of lymphocytes and other cells of the immune system. A single layer of tall cells that line the lumen of the organ. The epithelium that forms the innermost part of the mucosa has five distinct types of cells that serve different purposes, these are: enterocytes with microvilli, which digest and absorb nutrients; goblet cells, which secrete mucin, a substance that lubricates the wall of the organ; Paneth cells, most common in the terminal part of the ileum, are only found at the bottom of the intestinal glands and release antimicrobial substances such as alpha defensins and lysozyme; microfold cells, which take up and transport antigens from the lumen to lymphatic cells of the lamina propria; and enteroendocrine cells, which secrete hormones. A thin layer of smooth muscle called muscularis mucosae. A submucosa formed by dense irregular connective tissue that carries the larger blood vessels and a nervous component called submucosal plexus, which is part of the enteric nervous system. An external muscular layer formed by two layers of smooth muscle arranged in circular bundles in the inner layer and in longitudinal bundles in the outer layer. Between the two layers is the myenteric plexus, formed by nervous tissue and also a part of the enteric nervous system. General structure of the gut wall. Brunner's glands are not found in the ileum, but are a distinctive feature of the duodenum. Goblet cells in the wall of an ileum vili. At its sides, enterocytes are visible over a core of lamina propria. Cross section of ileum with a Peyer's patch circled. The small intestine develops from the midgut of the primitive gut tube. By the fifth week of embryological life, the ileum begins to grow longer at a very fast rate, forming a U-shaped fold called the primary intestinal loop. The proximal half of this loop will form the ileum. The loop grows so fast in length that it outgrows the abdomen and protrudes through the umbilicus. By week 10, the loop retracts back into the abdomen. Between weeks six and ten the small intestine rotates anticlockwise, as viewed from the front of the embryo. It rotates a further 180 degrees after it has moved back into the abdomen. This process creates the twisted shape of the large intestine. In the fetus the ileum is connected to the navel by the vitelline duct. In roughly 2−4% of humans, this duct fails to close during the first seven weeks after birth, leaving a remnant called Meckel's diverticulum. The function of the ileum is mainly to absorb vitamin B12 and bile salts and whatever products of digestion were not absorbed by the jejunum. The wall itself is made up of folds, each of which has many tiny finger-like projections known as villi on its surface. In turn, the epithelial cells that line these villi possess even larger numbers of microvilli. Therefore, the ileum has an extremely large surface area both for the adsorption (attachment) of enzyme molecules and for the absorption of products of digestion. The DNES (diffuse neuroendocrine system) cells of the ileum secrete various hormones (gastrin, secretin, cholecystokinin) into the blood. Cells in the lining of the ileum secrete the protease and carbohydrase enzymes responsible for the final stages of protein and carbohydrate digestion into the lumen of the intestine. These enzymes are present in the cytoplasm of the epithelial cells. The villi contain large numbers of capillaries that take the amino acids and glucose produced by digestion to the hepatic portal vein and the liver. Lacteals are small lymph vessels, and are present in villi. They absorb fatty acid and glycerol, the products of fat digestion. Layers of circular and longitudinal smooth muscle enable the chyme (partly digested food and water) to be pushed along the ileum by waves of muscle contractions called peristalsis. The remaining chyme is passed to the colon. In veterinary anatomy, the ileum is distinguished from the jejunum by being that portion of the jejunoileum that is connected to the caecum by the ileocecal fold. The ileum is the short termi of the small intestine and the connection to the large intestine. It is suspended by the caudal part of the mesentery (mesoileum) and is attached, in addition, to the cecum by the ileocecal fold. The ileum terminates at the cecocolic junction of the large intestine forming the ileal orifice. In the dog the ileal orifice is located at the level of the first or second lumbar vertebra, in the ox in the level of the fourth lumbar vertebrae, in the sheep and goat at the level of the caudal point of the costal arch. By active muscular contraction of the ileum, and closure of the ileal opening as a result of engorgement, the ileum prevents the backflow of ingesta and the equalization of pressure between jejunum and the base of the cecum. Disturbance of this sensitive balance is not uncommon and is one of the causes of colic in horses. During any intestinal surgery, for instance, during appendectomy, distal 2 feet of ileum should be checked for the presence of Meckel's diverticulum. ^ Guillaume, Jean; Praxis Publishing; Sadasivam Kaushik; Pierre Bergot; Robert Metailler (2001). Nutrition and Feeding of Fish and Crustaceans. Springer. p. 31. ISBN 1-85233-241-7. ISBN 9781852332419. Retrieved 2009-01-09. ^ a b Moore KL, Dalley AF, Agur AM (2013). Clinically Oriented Anatomy, 7th ed. Lippincott Williams & Wilkins. pp. 241–246. ISBN 978-1-4511-8447-1. ^ a b c Ross M, Pawlina W (2011). Histology: A Text and Atlas. Sixth edition. Lippincott Williams & Wilkins. ISBN 978-0-7817-7200-6. ^ Santaolalla R, Fukata M, Abreu MT (2011). "Innate immunity in the small intestine". Current Opinion in Gastroenterology. 27 (12): 125–131. doi:10.1097/MOG.0b013e3283438dea. PMC 3502877. PMID 21248635. ^ Sagar J.; Kumar V.; Shah D. K. (2006). "Meckel's diverticulum: A systematic review". Journal of the Royal Society of Medicine. 99 (10): 501–505. doi:10.1258/jrsm.99.10.501. PMC 1592061. PMID 17021300. ^ Cuvelier, C.; Demetter, P.; Mielants, H.; Veys, EM. ; De Vos M, . (Jan 2001). "Interpretation of ileal biopsies: morphological features in normal and diseased mucosa". Histopathology. 38 (1): 1–12. doi:10.1046/j.1365-2559.2001.01070.x. PMID 11135039. Wikimedia Commons has media related to Ileum. Look up ileum in Wiktionary, the free dictionary. Anatomy photo:37:11-0101 at the SUNY Downstate Medical Center – "Abdominal Cavity: The Jejunum and the Ileum"